These activities range from the very easy up to really difficult and require high levels of group-work and communication. 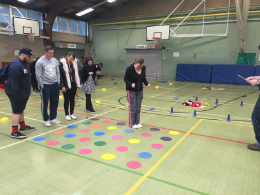 Each activity can be run separately or as part of a bigger team challenge. Some can be tackled in pairs or threes while others will be appropriate for bigger groups, most are tackled in groups of 5 to 7. Briefing notes are provided for groups that want to work independently. Take a look at individual descriptions of problem solving games below. Lea Green Centre has an ethos of ‘challenge by choice’ with an emphasis on children and young adults pushing their own personal limits. Activities have varying options based on ability or confidence levels. Team members need to give instructions to blindfolded team members to successfully use a ‘grabber’ to hook a boat, communication is key here. Team members need to move as a single unit, displaying good communication and teamwork skills to ensure everyone moves at the same pace. With one person nominated from the team to be inside the circle, the team need to work together to turn letters over in alphabetical order using good planning and memory skills. The team need to transport a ball from start to finish through an obstacle course, if the ball drops, the team need to start again! Decision making, teamwork and communication are key to this task. One at a time, team members need to plan a route through a ‘minefield’ with only one correct route that a single group member knows about. Team members will need to remember where ‘mines’ were located once they have encountered them (and the sound effects from their team!) to complete their mission successfully. 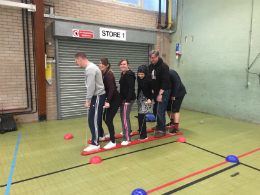 All team members need to successfully cross a ‘river’ using a ‘boat’ – the team are split into nuns and cannibals and at any point there must be more nuns than cannibals on both sides of the ‘river.’ The team need to work together to cross the ‘river’ in as few moves as possible! 16 coloured spots on a board need to be covered by 16 coloured discs, the colours cannot match so the team need to work together to plan their moves carefully. With equal numbers of the team standing either side of the centre space, team members need to swap positions using ‘legal’ manoeuvres as set out in their rules. Tyres are used as stepping stones and the team need to get from point A to B without touching the ground, displaying teamwork in both pairs and the overall group.